Our dog Grant goes by a lot of names: “No Grant,” “Drop It Grant,” “Cut It Out Grant,” “God Grant Me the Patience,” and very occasionally, “Bud.” When I first adopted this little black-and-white ball of mischief, his foster-given name was actually “Granite.” But that was before I noticed his ongoing playtime propensity for chewing, gnawing, and shaking things around — especially my best throw pillows, which he seems to believe require “killing.” I found myself intoning his name so regularly that I finally became too lazy to deal with the second syllable. Over time, I’ve gradually helped Grant overcome his neurotic need to nibble. Well okay, it’s probably more accurate to say I’ve coaxed him toward more productive options. These include nutritious snack substitutions that help keep his teeth strong, while safeguarding my house. Because let’s face it — dogs like to chew, and healthy teeth play a critical role. A domesticated dog’s teeth share many similarities to those of wolves and coyotes in the wild. That’s because in both cases, those teeth are designed to process the protein so vital to good health. Your sweet pup actually has an instinctive drive to chew — and to put it plainly, canine teeth are shaped for efficient slicing and gnawing through fibrous material. Baked kibble disintegrates into starchy paste that sticks between teeth and gums, which can lead to periodontal disease. Contrary to popular belief, kibble does nothing to “scrub” teeth clean. If you’ve been led to believe this by clever marketing campaigns, pour yourself a bowl of Grape Nuts or grab a granola bar. As you’re chewing and swallowing, evaluate how wintry fresh your teeth actually feel. Cooked bones can often splinter in dangerous ways. 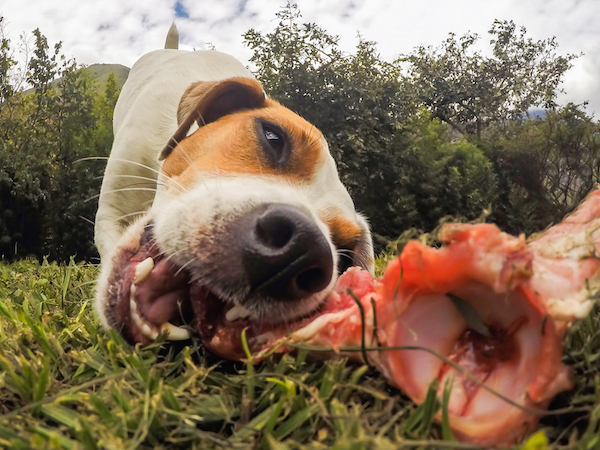 But did you know that raw, uncooked bones contain enzymes and probiotics that can help your pup’s mouth maintain an optimal balance of bacterial flora? These bones also provide a nice calcium boost, which supports strong bones and teeth. My canines are on the smallish side, but we still prefer to go with larger, humanely sourced bones that provide an extended chewing workout. Tuckers Frozen Bones are one well-respected raw option. If you’re especially concerned about food safety, you can also try naturally smoked commercial products like Jones Center Bones. Either way, use a towel underneath to minimize messiness! Dog chewing raw bone by Shutterstock. An occasional tasty raw carrot is low in calories — yet high in vitamin A and beta-carotene. Sliced cucumber sticks, in moderation, are a good source of kidney-supporting potassium. And celery sticks provide fiber, folate, riboflavin, plus vitamins A, C, and K. Quick, easy, inexpensive. Turns out some of these sweet little gems are actually “berry” good (yeah, I went there) for your dog’s dental health. Cranberries, raspberries, and blueberries contain high concentrations of a compound called NDM, or non-dialysable material. This can help discourage the formation of plaque. A study published in the Journal of the American Dental Association gave a special shout-out to cranberries, which are apparently a solid source of tannins and flavonoids that can stop problematic bacteria from sticking to teeth and gums. A research team representing both Rutgers University and the University of Rochester School of Medicine and Dentistry also found that these special compounds can thwart acid formation, thereby minimizing decay. Start with just one or two frozen berries, then monitor digestion and stools. If everything’s looking good after a week, feed up to four frozen berries per 30 pounds of dog every three to five days. Green tea is full of flavonols — antioxidants that can help fight inflammation and neutralize free radicals. Since most dogs have trouble processing caffeine efficiently, purchase plain, decaffeinated green tea bags. Use three bags to brew up a pot of weak green tea, then freeze into ice cubes. They’re great for occasional chewing, and soothing the gums of teething puppies too. 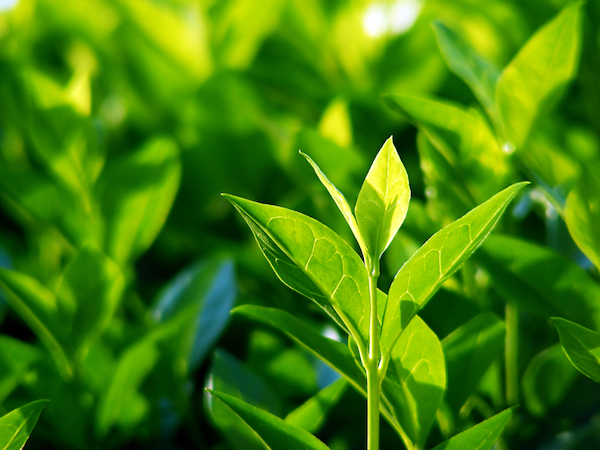 Green tea plants by Shutterstock. That humble “mini-tree” garnish is actually one of the most concentrated nutrient sources around. Plus, major bonus: Its natural antimicrobial properties can help freshen doggie breath. Try boiling three cups of water, and placing ¼ cup fresh parsley in a bowl. Pour the hot water on top, and let everything steep for about 15 to 20 minutes. Remove the parsley with a spoon, pour the liquid into ice cube trays, and freeze for a ready supply of super-cool chewing satisfaction. Got a toaster oven? You can make these yummy, vitamin- and fiber-rich chew treats in under 10 minutes. Grab a raw, scrubbed sweet potato. Keep the skin on, and cut into thin slices. Place these on a cookie sheet and bake at 250 degrees F. for about three hours. 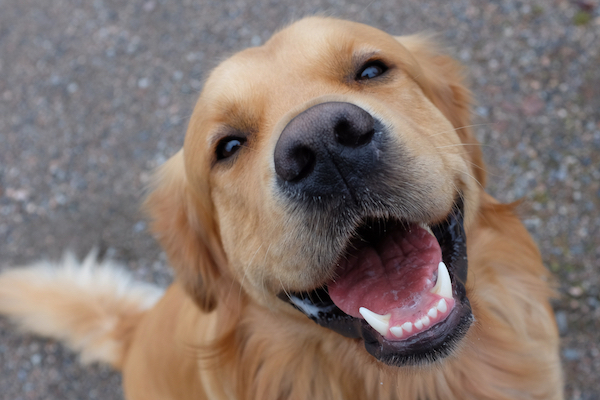 Do you have healthy, natural snack and chew alternatives that support your pup’s dental health? Share your insights! The post 6 Natural Treats That Are Good for Your Dog’s Teeth appeared first on Dogster.